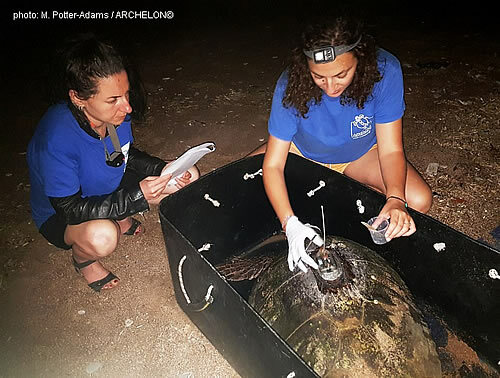 Satellite tags deployed in loggerhead turtles from southern Kyparissia Bay to study their inter-nesting and post-nesting movements! Kyparissia Bay, situated in western Peloponnese, hosts the second largest nesting population of loggerhead turtles in the Mediterranean Sea. The higher numbers of nests is found at the southern part of the Bay, in a 10-km long core nesting area. ARCHELON has been working in this area conducting a long-term loggerhead tagging project since 1982 and runs a monitoring program of nesting activity every year since 1984. Mid June this year, ARCHELON’s team started a new, exciting project in southern Kyparissia Bay, funded by MAVA Foundation. 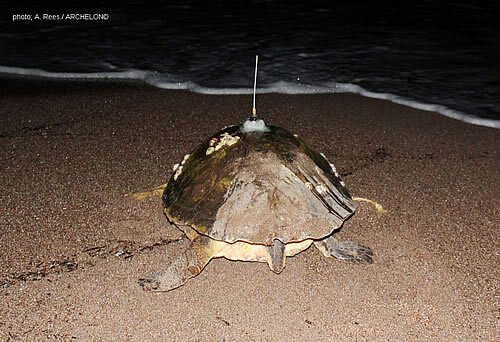 Satellite tags were deployed in 9 loggerhead turtles in order to investigate their movements at sea between each nesting effort as well as their movements after their nesting is completed for the season. Data from satellite tags are also expected to give us some indication about their migrations towards overwintering and foraging habitats. This knowledge will, in turn, be used to design better management strategies for their conservation and reduction of negative interaction with fisheries. How does the satellite tag work? We all know that female sea turtles are emerging from the sea to nest during night hours. 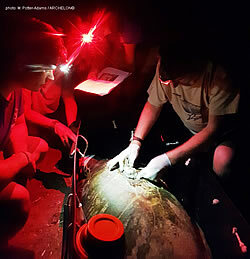 Right after nesting is completed, trained scientists attach a specially designed small-sized transmitter to the carapace of the sea turtle. 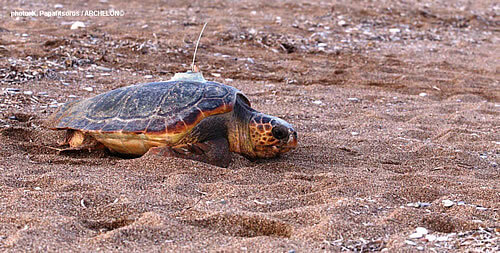 As the turtle surfaces for breath or comes completely out of the water, the transmitter sends a signal to an Argos satellite and this is how researchers can easily follow the turtle’s movements. Besides tags, these 9 female sea turtles were also given names. Seven of them were named after ancient Greek mythological figures: Elaia, Neda, Polymnia, Posidonia, Thalassa, Thalia, Thetis. The remaining 2 were named Μaia and Vera, a dedication to the memory of Dr Luc Hoffmann, founder of MAVA, dear friend and mentor of ARCHELON. The movements of these 9 loggerhead sea turtles are now online and you can enjoy following them around in this link: http://www.seaturtle.org/tracking/?project_id=1299!